Pure K⁺ 0-0-27 with 14% Calcium is 100% soluble and boasts three (3) sources of potassium and calcium. The primary potassium and calcium sources are reacted to “gas off” the oxides, resulting in K⁺ and Ca⁺⁺! 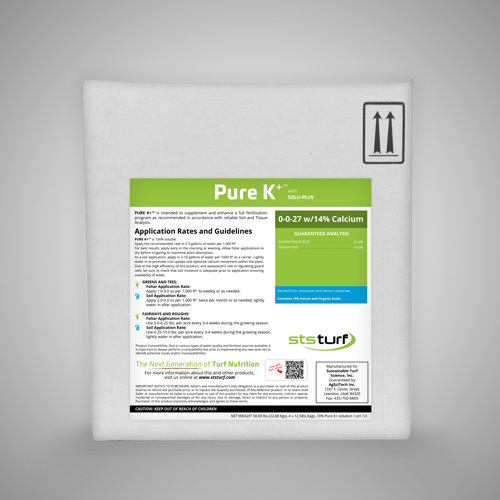 Pure K⁺ contains two more organic forms of proprietary K and Ca, which are readily available. The potassium is complexed, while the calcium sources are fully chelated, using plant available organic based carriers. Pure K⁺ 0-0-27 with 14% Calcium provides a readily available source of potassium to assist with photosynthesis, and activate enzymes to metabolize carbohydrates for the manufacture of amino acids and proteins. This product will assist in the movement of complex carbohydrates and sugars, increase stem rigidity, boost drought and wear tolerance, and improve stress resistance. Pure K⁺ contains three high quality calcium sources that are incorporated to optimize energy, signaling, cell development and integrity, promote root growth, and aids in carbohydrate translocation, and nitrogen absorption. Completely Soluble Postassium & Calcium! Injection/Fertigation Rate / Acre 1.25 - 2.5 lbs.